It may look like “just” dirt and rocks but what lies within the 1,500-year-old Hohokam village ruins at the 95-acre park is a mystery. There are debates among archaeologists about what happened to this native Indian tribe and why they abandoned the area around AD 1450 and disappeared after living there for over 1,000 years. 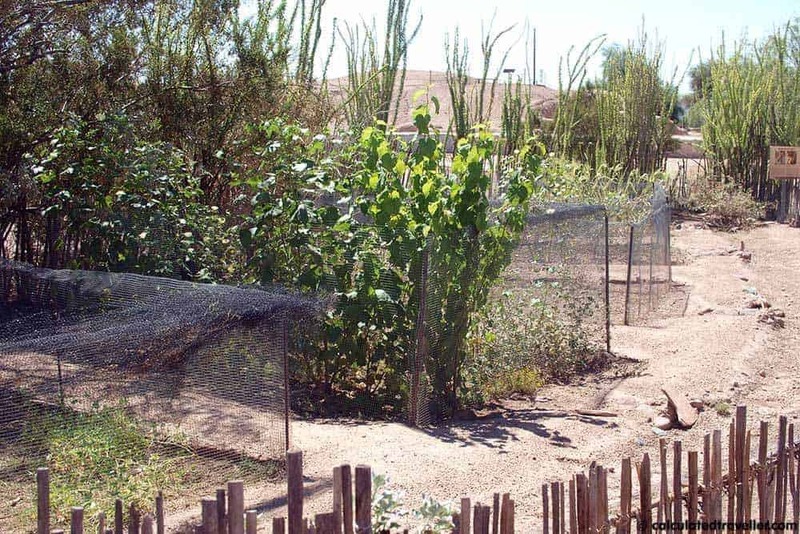 It is believed that the Akimel O’odham (Pima) and the Tohono O’odham (Papago) Indians are their descendants but why did they leave and where did they go? Was it environmental reasons, conflict and war, disease, or did they just need more space? Located downtown less than a mile from the Phoenix Sky Harbour International Airport, the Pueblo Grande Museum and Archaeological Park has been dedicated to studying the indigenous Hohokam Indian culture since 1929. In continuous operation for over 80 years, the park and museum were designated a National Historical Landmark in 1964. Museum staff suggested to us that the best way of touring the site is to walk the 2/3-mile interpretive trail around the ruins first before returning inside to view the Museum displays. The trail is self-guided, and the path is well-marked and paved with descriptive, educational signs throughout. Trail highlights include the platform mound (AD 1450), adobe compound reproduction, pit house reproductions, ball court and garden. 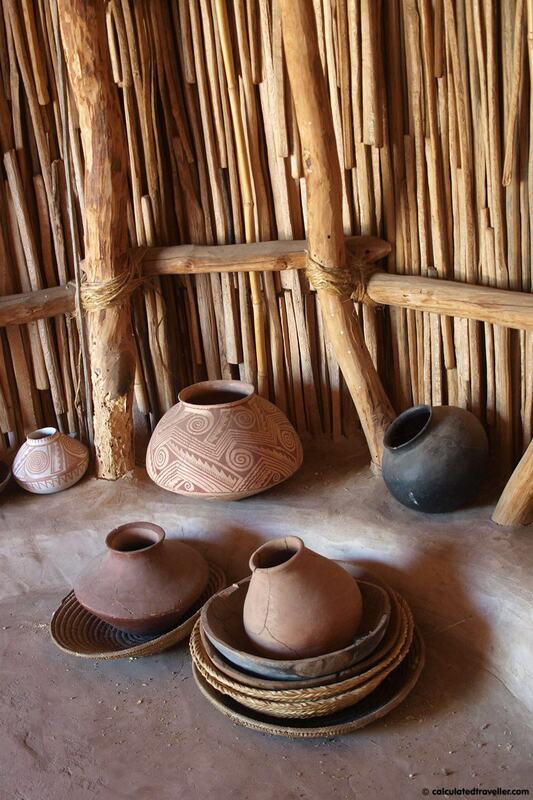 Inside the Museum there is an orientation video, interactive archaeology gallery, landscape and Hohokam lifestyle gallery with art, pottery, tools and jewellery on display as well as a changing exhibit gallery featuring history and archaeology of the region. 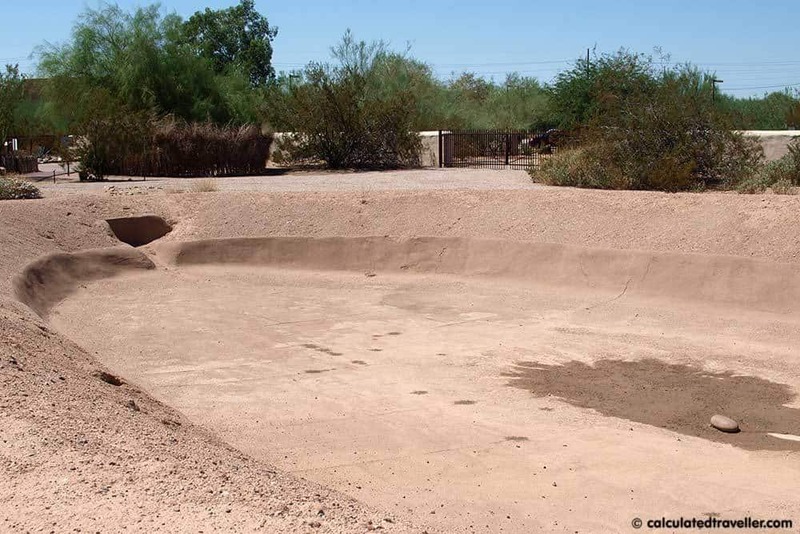 The Hohokam people were expert farmers (cotton, corn, squash, amaranth and beans) but they were also expert engineers and created over 1,000 miles of canals to irrigate their fields. You would have walked past the historic canals at the beginning of the trail but in-depth tours of the remnants of these canals – the “Park of Four Waters” – are available only on specific days (see contact info below). We quite enjoyed learning about the Hohokam people and their history and effect on the birth of Phoenix at the Pueblo Grande Museum and Archaeological Park. 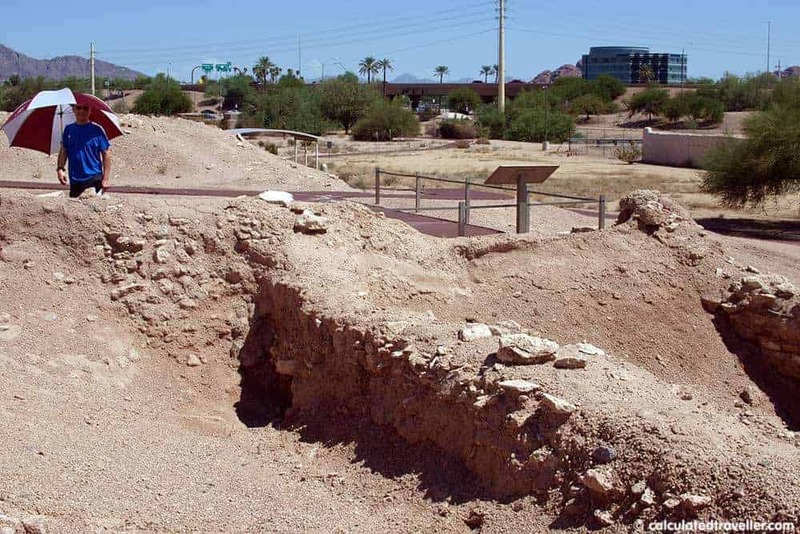 The canals that the Hohokam people engineered and created to survive are directly responsible for the settlement of Phoenix and are still partly in use today. I wondered what the Hohokam imagined for the future of this area as I stood there in the middle of the ruins looking up at the planes flying over my head and listening to the sound of the cars drive by on the nearby Hohokam Expressway 143. Allow 1 1/2 hours for your visit. Umbrellas are available at the entrance to the trail. Take one – trust me – there is little to no shade along the trail. There is a gate to lead you back to the museum after the garden (stop 5 on the guide map). It is not necessary to go all the way back to the beginning of the trail. Visit http://phoenix.gov/recreation/arts/museums/pueblo/index.html for hours of operation, lectures, programs, workshops and special events listings. Note: Thank you to the Pueblo Grande Museum and Archaeological Park and Scottsdale Convention and Visitors Bureau for complimentary admission in exchange for this review. The opinions expressed, positive and/or negative, are entirely that of the author and are not a reflection of the compensation received. 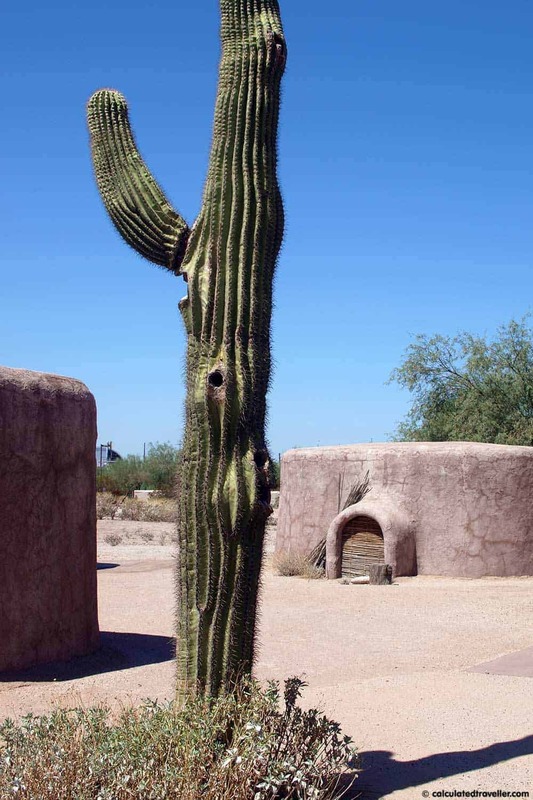 Tombstone, Arizona – It’s A-O.K. I lived in Phoenix for 6 years and had no idea this was downtown! I’ll have to check it out on my next visit.